I like elements which are hybrid rather than “pure,” compromising rather than “clear,” distorted rather than “straightforward.” …I am for messy vitality over obvious unity. In Complexity and Contradiction in Architecture, Venturi calls the house he designed for his mother a “little house with large scale.” Completed in 1964 in Philadelphia, its visual vocabulary is eclectic, incorporating a diverse group of individual elements into its design. The Vanna Venturi House is both complex and simple, open and closed, big and little. Some parts of the house exhibit contrasting characteristics simultaneously, seemingly contradicting itself. These elements at first seem at odds with each other, as they are very different, but these contrasts are in fact essential to the careful balance that is ultimately achieved in the design. From the outside, the most prominent element of the house is a large front facade, split into two triangles by a gap in the middle that reveals an asymmetrical chimney that sits back from the front of the house. Contrast in scale occurs between the front facade and the interior plan, and this scale changes and evolves as you move through the house. Venturi gave the front facade a large scale to balance the complexities that occur within the interior, saying in his seminal book on postmodern architecture, Complexity and Contradiction in Architecture, that a small scale in combination with high complexity creates a feeling of busyness in buildings, whereas a large scale in combination with high complexity achieves a purposeful tension. As you approach the house, the front facade establishes a large scale with its vast solid plane. The large square cutout of the exterior entry is made to feel even larger by its shallow depth, and because of the smaller front doors that are concealed within it. The curved wood moulding, the interrupted nod toward a traditional arch, over the door is large and also increases the scale of the exterior. The smaller front doors decrease the perceived scale of the house, and upon entering the house, the scale is reduced once again by a narrow interior entry. This interior entry, in turn, is constricted by a curved wall on the right and a diagonal wall on the left. Continuing through the interior entryway, the house returns to a larger scale, opening up to the large living room, which is the core of the house. The floor plan is very symmetrical, with a large central core from which two diagonal walls radiate. The diagonal walls each separate a main end space in front from a large back space. On the northeast end of the house, the diagonal wall separates the kitchen from the dining room. On the southeast end the diagonal wall separates the two first floor bedrooms. In the core of the house, the two main vertical elements, the fireplace/chimney and stair, compete for space and each compromise to accommodate the other. The fireplace distorts on the east side to make room for the stair, and the stair suddenly narrows on the west end to allow the fireplace to come forward toward the front door. Upstairs, a symmetrical rectangular bedroom looks toward the rear of the site through a semicircular wall comprised of a pair of large french doors flanked by large curved windows. Many elements of the house contrast between simplicity and complexity. The front facade is both simple and complex at once, which serves to both balance and acknowledge the complexity of the interior. 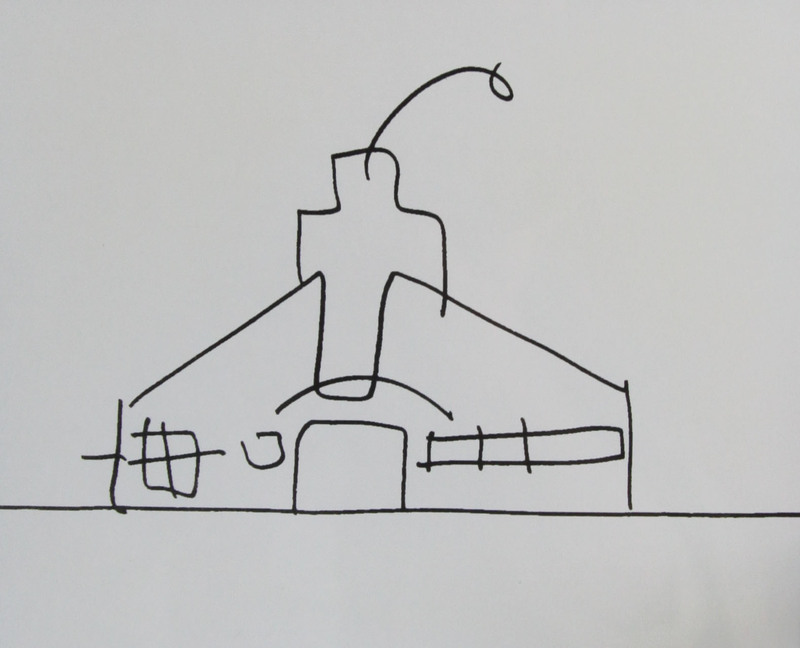 It is simple in several ways: its vast horizontal plane is uncomplicated, and its common use of windows and doors evokes the common symbol—in Venturi’s words, “a child’s drawing”—of a house. But it is also complex: the doors and windows are balanced on each side of the font entrance, but they are asymmetrical, acknowledging the distortions and complexities that occur in the floor plan. The exterior walls embody another instance of contrast in the design; they are both open and closed, rigid and porous at the same time. On the one hand, their consistent shape along the edge of the plan gives them a rigid feeling that is very closed. On the other hand, the large openings in the walls, such as the split in the front facade and the windows placed near the corners of the house, give a feeling of openness. The inside and outside of the house do not purely contradict and contrast each other. The floor plan has a symmetry that is similar to the outside, and the exterior has breaks in it that correspond to the distortions in the floor plan. For example, the large separation that disrupts the continuity of the front facade is in line with the distorted space of the fireplace and stair. The small square window just to the left of the large entrance opening lines up with the interior wall that separates the living room from the bedroom. The horizontal banding that runs the entire length along the bottom third of the front facade mirrors the area of the floor plan where the most complex shapes occur. Within the house there is an even balance of rectangles, diagonals and curves, which gives the house an eclectic visual richness. Outside, there are rectangles in the front entry and windows, diagonals in the roofline, and a curve in the applied wood moulding above the entry. Inside, the living room and bedroom plans are rectangular, the two walls of the entry are curved and diagonal, and in section there is a curved wall in the dining room. In the second story bedroom there is a large curved rear window, while the plan is rectangular. Overall, the Vanna Venturi House is made of a diverse group of elements that achieves balance through a precisely calculated use of contradiction and inclusion. Its features coexist and supplement each other by contrasting one another; the house achieves a complex harmony that pushes back against the simple, rigid modernistic principles that Venturi opposed. The Vanna Venturi House is a compelling example of an eclectic design that brings together a great number of seemingly contradictory elements to achieve a rich visual whole that remains aesthetically, not to mention culturally and psychologically, interesting and relevant half a century after it was built.